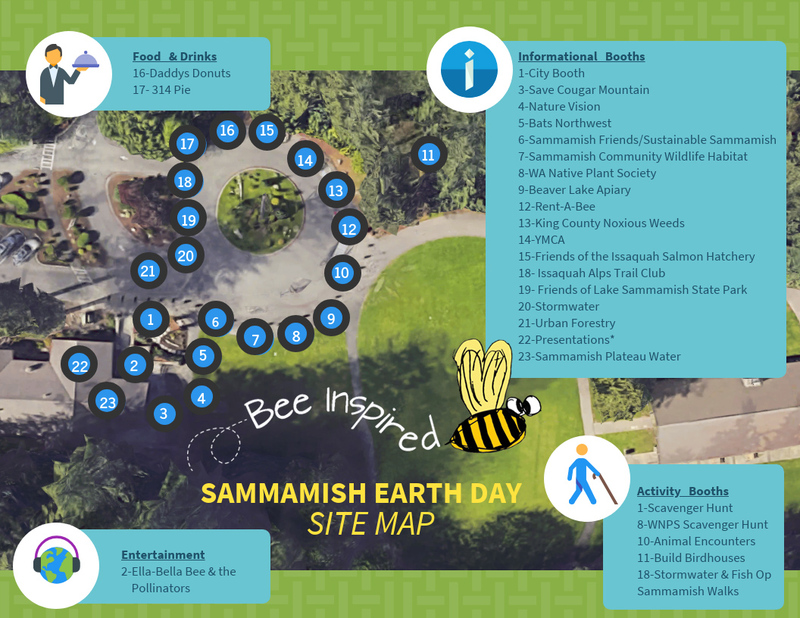 Join us for the City of Sammamish Earth Day celebration! This event will feature crafts, activities, informational booths, prizes, food trucks, performances, presentation and many more! All ages are welcome! Volunteer to help with event activities, set-up, and take down: Sign up! The Sammamish YMCA is partnering with the city to support creating wildlife habitat and remove invasive plants - Volunteer to help: Sign up! Pepper Hambrick with Friends of the Issaquah Salmon Hatchery 10:15 a.m.
Marcia Rivers-Smith with Washington Native Plant Society 11:00 a.m.
King County Noxious Weeds 12:00 p.m.
Ella-Bella Bee & the Pollinators 11:00 a.m. - 1:00 p.m.